Corticaria japonica, copyright Kohichiro Yoshida. 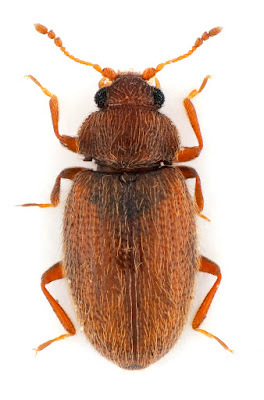 The Latridiidae are a group of minute beetles that feeds as adults and larvae on fungal spores, and are commonly found associated with dead vegetation or leaf litter (Lawrence & Britton 1991). Characters (from Lawrence & Britton 1991, as Lathridiidae): Minute; clypeus laterally expanded in front of antennal insertions; antenna ten- or eleven-segmented, with two- or three-segmented club, antennal scape usually large and more or less globular; pronotum usually much narrower than elytral bases; fore coxae projecting, trochantins concealed, fore coxal cavities internally and externally closed; elytral punctures more or less seriate; mid coxal cavities contiguous or narrowly separated, laterally closed; tarsi trimerous; abdomen with five or six ventrites, none connate. Larvae elongate, tapered posteriorly, lightly sclerotised except for head, with vestiture of long, fine setae or occasionally shorter, frayed setae; antennae relatively long; mandibles often partly membranous; mala obtuse. [W08] Wetterer, J. K. 2008. Worldwide spread of the longhorn crazy ant, Paratrechina longicornis (Hymenoptera: Formicidae). Myrmecological News 11: 137–149.